This holiday camping site is situated in one of the most convenient locations in all of Italy. 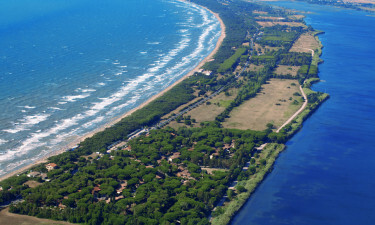 Found within a lush oasis and only ten kilometres from Maremma Natural Park, Orbetello Village is a dream come true for anyone who is seeks luxury camping punctuated by a wide spectrum of interesting and unforgettable experiences. To secure reservations or for more information, please contact Lux-Camp. 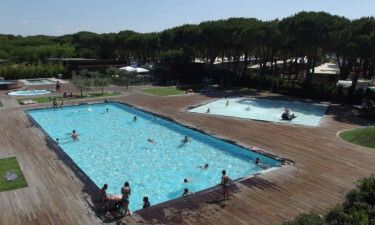 Beautiful campsite situated only ten kilometres from Maremma Natural Park. 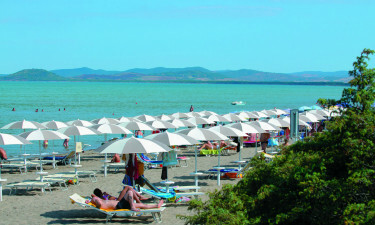 Orbetello has to pools and is situated directly on the shores of Tuscany. Why should I select Orbetello Village near Albinia for a much-needed holiday? This luxury camping site is highlighted by an unbelievable 85,000 square metres of unbeatable camping excitement. Additionally, all accommodations are within literal walking distance to the crystal waters of the Adriatic Sea. The nearby natural park will offer untold hours of peace while historic villages such as Tarquinia, Pitigliano and Saturnia provide ancient thermal spas. Mount Argentario will afford splendid views of the surrounding country while the seaport of Santo Stefano provides retail attractions and fine dining. There are shopping facilities (for grocery items and other camping necessities) located within this holiday camping site while a newly renovated restaurant offers traditional Maremma cuisine alongside international platters. Of course, the selection of pizzas here cannot be beat and a menu for children is available. This restaurant will also serve up a local beer or a tasty cocktail for those who work up a bit of a thirst. Please contact Lux-Camp for more details in regards to how this location is ideal for a future camping holiday.